Making baked stuffed mushrooms is fun and easy. Try dividing the stuffing and add different ingredients to make a variety of stuffed mushroom appetizers. Add any seafood such as crab meat or shrimp. Omit the Parmesan and add cream cheese with bacon to the mixture. Another idea is to omit the Parmesan, substitute with sausage and mozzarella cheese. The possibilities are endless once you have this basic stuffing mix made. 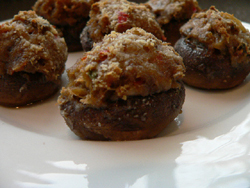 Click here to share your own ideas for making stuffed mushrooms. Melt butter in medium sized skillet. Brush outside of each mushroom cap with melted butter. Use remaining butter in pan to saute onion and red pepper until onion is translucent then add remaining ingredients except the cheese. Saute until onions and mushrooms for about 10 to 15 minutes until cooked through, add a little more butter if needed to saute. Remove from heat and stir in the Parmesan cheese. Stuff each mushroom cap with mixture, top with sprinkle of Parmesan. Place on a foil lined cookie sheet or jelly roll pan, spacing at least an inch apart. Bake at 350°F for 15 to 20 minutes. Foil on the pan is not necessary but will help with a quick and easier clean up.